I saw a bit in the Telegraph regarding the problems surrounding all the mackerel in Iceland and the Faroe Islands. Yes, the mid-latitude Atlantic fish, and yes, the smallish island countries between Scandinavia and Greenland. Plus Russia. A lot of science comes together here: climate science, biology, political science, economics…. (Today I’m using “science” in a broad sense like the German Wissenschaft, but not debating ‘soft’ vs. ‘hard’ sciences.) Let me explain. The details are complicated, but Iceland, Russia, and the Faroe Islands have the opportunity to catch a lot of mackerel that they didn’t formerly have accessible. The mackerel are migrating farther north in the summer than they used to, because of warmer waters in the the North Atlantic. That’s great for Iceland, but between them Norway and the European Union, in a legally binding way, had claimed 90% of the mackerel catch deemed safe by fish experts. Neither Iceland nor the Faroe Islands nor Russia is subject to those agreements. They’ve collectively and unilaterally awarded themselves 355,000 tons of mackerel catch beyond the amount that was deemed safe by the fish experts and agreed to by all the other state parties to the Northeastern Atlantic mackerel catch. 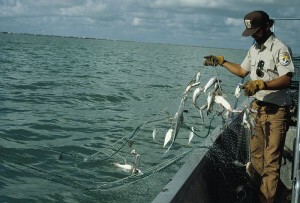 Not Grandpa’s fishing net: Commercial fishing nets can be many miles in length. I’m not making an anthropogenic claim about the ocean warming today. (Not that I couldn’t.) Scientists are figuring out what fraction of the North Atlantic warming is due to humans and how all that might end up. So, I would say smart people are working on that, but certainly the waters are warmer than in recent history, and there are more mackerel in the north Atlantic these days for reasons that relate. Which brings us to the fish: Their biology influences their migration in a number of relevant ways which are still subject to scientific debate. So that’s another thing that should be understood in more detail. But no matter: the fact of the change in their migratory patterns is not apparently open to much debate: Icelanders didn’t formerly catch mackerel, and now they do. The bottom line is that when the temperatures change, so do the migratory habits of the fish. The economics of supply and demand are also very much in play here. In the immediate term, the new availability of mackerel for fishing in the northeastern Atlantic means that more fish can be caught in total. The presence of mackerel now corresponds with the fishing ranges of several major fleets previously excluded from that game by the paucity of mackerel in their regions. In the short term, the price of mackerel crashes because more suppliers are now able to dump mackerel on the markets. This bankrupts small mackerel fishers immediately. In the long term, though, overfishing of the mackerel could diminish their ability to replenish their numbers, depleting the mackerel stock on a long-term basis — or even exposing the mackerel to a risk of extinction (Hall, Millner-Gulland, and Courchamp, 2008). On that timescale, the depletion of mackerel could put major economic sectors of the Atlantic, European, and Russian nations in the tank — especially if they’ve committed significant capital to the mackerel catch. Finally, the politics are not at all clear, here. We have a situation where technological development has empowered people to take fish at rates scarcely distinguishable from annual, regional natural disasters. (More background on that.) Clearly this is an issue whose consequences transgress national boundaries. Whence policy that protects everyone’s food supply, then, if there’s no transnational law that binds the players? Since some players in the fish catch seem exempt from regulation and willing to fish beyond reasonable limits, the immediate-term incentive for all the fishers is to take fish as rapidly as possible before they’re extinct or the laws get changed. Which may cause the extinction of the fish. Everybody loses forever in this regime, but short of war, complicated international agreements, or self-sacrificing restrictions voluntarily adopted by a controlling fraction of the players, there’s no obvious logic that stops it. Except, of course, scientifically responsible and sustainable fishing practices endorsed by all. Seafood accounts for up to 16.5% of the protein consumed by humans, with strong regional variations favoring those most able to adapt should fisheries collapse. Maybe you ate some fish today. In sum, while there’s some material that’s open for discussion, what’s clear is that this is a problem set that needs resolution quickly, and science informs both the problem and the solution from all sides. So, think about that during the next school board meeting. There are no isolated players in a global environment. This entry was posted in The Science-Minded Citizen and tagged climate science, commercial fishing nets, environment, fish experts, fish fights, global warming, political science, science biology, using science, warmer waters. Bookmark the permalink. The main question is: Who have the rights to the resources in the sea. As the article says the huge number of mackerel in the North Atlantic has a huge impact on other fish spices and this is one of the main arguments for Ice Land and Faeroe Islands to demand a bigger part of the catch. If EU is concerned about the sustainability they should reduce their own part until a new agreement is in place. EU is fishing the same amounts as before and accuse Faeroe Islands and Iceland for over fishing but EU is as guilty as these small nations. I am living on Suðuroy the most southern of the Faeroe Islands with 5000 inhabitants. For the last 50 years the population has gone down with one family leaving the island each month on average. That changed last year when a new hi tech fishing plant was build to process the mackerel. Workers on the old fishing plants was mostly uneducated with low paid jobs. The jobs on the new plant is based around automation and computers which requires educated workers. Young people are now coming back after they have finished education, for the first time in generations. Another discussion that is raised as a result of the new income from mackerel is how the taxation of the fishing and the prices for fishing permits should be handled. In the Faroese Parliament that has led to heated debates. As the natural resources like fish is migrating due to climate changes we will see more of these confrontations between nations and internal conflicts to get a part of the new wealth. I find myself able simultaneously to celebrate the good fortune of the Faroese and to worry about the future of the North Atlantic fish stocks. I sincerely hope that all parties can come to mutually tolerable agreements that both fairly share the economic opportunity and preserve the natural resource for future generations. I Couldnt agree more with the views just expressed, we have to be more careful with how we treat our homebase. To do otherwise is just plain genocide. I live by the sea in Southern California. Fifty years or so ago, the mackeral caught around here were about 200-cm or so long. The fishermen are still catching lots of mackeral, but most of them are about 20-cm in length.